Magdalena Aotearoa was honoured to host this festival, featuring outstanding women performers from around the world, from 21 March to 3 April 1999. Click here for highlights and photos. During a week of performance, workshops, forums and visual spectacular, we were inspired, moved, challenged, awed, exhausted, educated, blown away, fed, transformed, acknowledged, supported, stimulated and so much more. A crew of dedicated technicians, stage managers and theatre staff worked tirelessly throughout the Festival to get the shows turned around. Right, Technical Director Lisa Maule remembers to take time out to feed her son Giovanni. 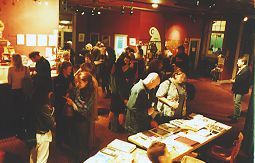 Venues in Wellington were Shed 11 and Circa Theatre (below), where the foyer was a place for meeting, eating, and sharing. The Wellington part of the Festival finished at 2am on 29 March with a poroporoake (closing ceremony) where participating artists, organisers and crew were thanked and thanked each other for the enormous amount of work and time and energy that was poured into the Festival. Particularly moving were speeches by and for Dah Theatre from Yugoslavia, who cut short their time in New Zealand to return to their families in Belgrade as NATO began to bomb their country. On Monday 29 March women from the Festival held a silent protest against the escalation of war in Yugoslavia at the American Embassy. Click here to go to Kathy Randels’ statement on the Peace Movement Aotearoa website. Over Easter, the Festival moved to Paekakariki, where Maori women hosted a further 3 days of workshops, performances and partying. The schedule of performances for Wellington events is still available online to as a record of the extensive programme, and photos and highlights are also available.